with 5 questions a day. Keep challenging and improving yourself through personalized adaptive learning system. The difficulty of your questions increases or decreases based on your daily scores. The better you get, the harder it gets. Learn something today and apply it tomorrow. The questions tackle real-life, common, and relevant language and culture pitfalls. Receive your email with a link to your daily test. Emails are packed with interesting tidbits, funny anecdotes, and useful information. Take 5 minutes to complete your test. Yes, 5 minutes is all it takes. 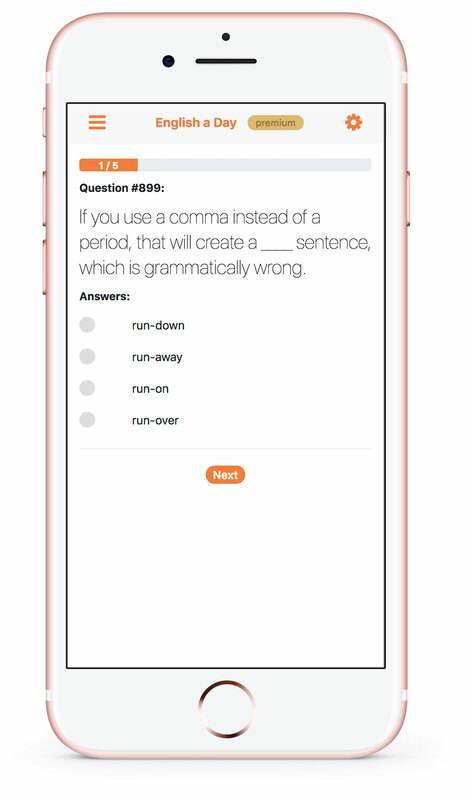 Questions include fun sound bites, famous quotes, and tricky grammar, to name a few. The questions are designed to help you identify your language blind spots - and enable you to correct errors that you might not even be aware you're making! The higher you score, the smaller the apple gets! You can understand basic English phrases and expressions in daily life. You can understand and communicate routine information. You can communicate in simple language about personal ideas, plans, feelings and experiences. You can communicate with native English speakers and understand complex topics. You can understand and use English flexibly and effectively for academic purposes. You can communicate very fluently and precisely in very complex situations. For me English a Day is a marvelous way to improve my English and to stay tuned. The tips and videos you get every day together with the test are a very nice supplement and I love them. The app is really good and I enjoyed doing the tests very much. English a Day is perfect for me, because I don’t want to attend a full English course. This is therefore very helpful in learning English! Every morning, I am enjoying myself with EaD. I learn a lot. I'm a English teacher here! I would like to know how your systems work! If you want to do this here in Brazil! Do you need English at a high level? Are you an ambitious student? Use questions from our five categories to take your English to the next level. More than a text book. Our knowledge base gives more in-depth information about language matters related to our questions. If you cannot find what you are looking for, use the search button and read our articles. If your question is not answered, you can leave your comment, suggestion, or question and we will get back with you as soon as possible. English a Day is an interactive online web app to help you improve your English language skills. By taking a daily test of five questions, you'll get better every day. English a Day is a production of Taaltutor and Headbloom. Read our disclaimer for more legal information.